Pssst … want to know a secret? Strategically placed mirrors can make any room in the home seem bigger — especially a bathroom! Placing a striking mirror in the bathroom … or several mirrors … can open up the feeling of the space and change a ho-hum bathroom into a gorgeous setting. To find the right color, shape, size and look for your bathroom, start by finding mirror ideas online, in stores and even in bathrooms you visit at the homes of friends and in restaurants! Whether you decide to invest in one large mirror or a dozen smaller mirrors, you can transform your bathroom setting with your own reflection. 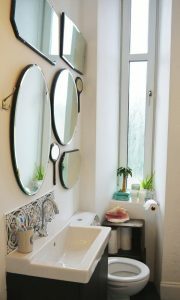 Here are some of our favorite bathroom mirrors we think make the most of bathroom space!